Sally has enjoyed a very busy and varied freelance career since graduating with a first class honours degree from Birmingham Conservatoire in 2001, where she studied with Michael Seal and Peter Thomas. Encouraged by teachers and peers, Sally embarked on studying the viola along-side her violin studies during her A level years and was very soon playing inspirational symphonic works in Birmingham Philharmonic Orchestra and joining many professional players in chamber music concerts in and around the west midlands as a violist. Sally went on to lead the Birmingham Conservatoire Symphony Orchestra and also won the Hebert Lumby Violin Prize during her higher education studies. In 1999 she gained a place on the London Philharmonic Orchestra’s desk-partnership scheme and after graduating Sally continued her studies with Peter Thomas. 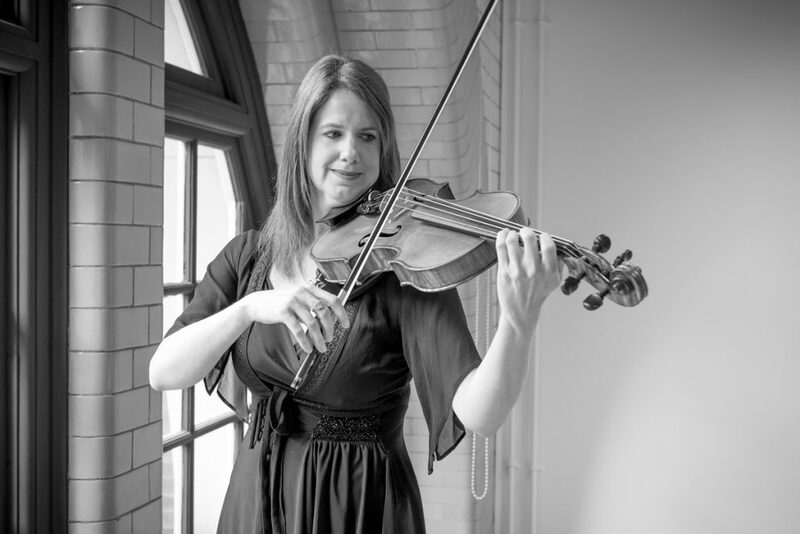 Sally has performed and toured with The City of Birmingham Symphony Orchestra as an extra-player and has undertaken regular work with The English Symphony Orchestra both as a violinist and a violist. She has played for many years as a first violinist with Longborough Festival Opera which has enabled her to perform the whole of Wagner’s Der Ring des Nibelungen with a stunningly brilliant company. Sally has also enjoyed freelance work as a chamber musician and has had the opportunity to perform several solo works with various local orchestras over the years including Vaughan William’s The Lark Ascending, Mozart’s Violin Concerto no.3 in G Major and Rimsky-Korsakov’s Scheherazade. Sally has also carved a name for herself as a Jazz violinist over the last 15 years and has a great passion for the music of Stephane Grappelli and other great players such as Joe Venuti. Her award-winning quintet Fret and Fiddle have enjoyed many years of success and have just completed their fourth album. They have won awards from Jazz organisations such as Stafford Jazz Society and have performed and toured in the UK and beyond. Sally has been playing violin and viola in Highly Strung since 2003 and became a permanent member of the quartet in January 2017.